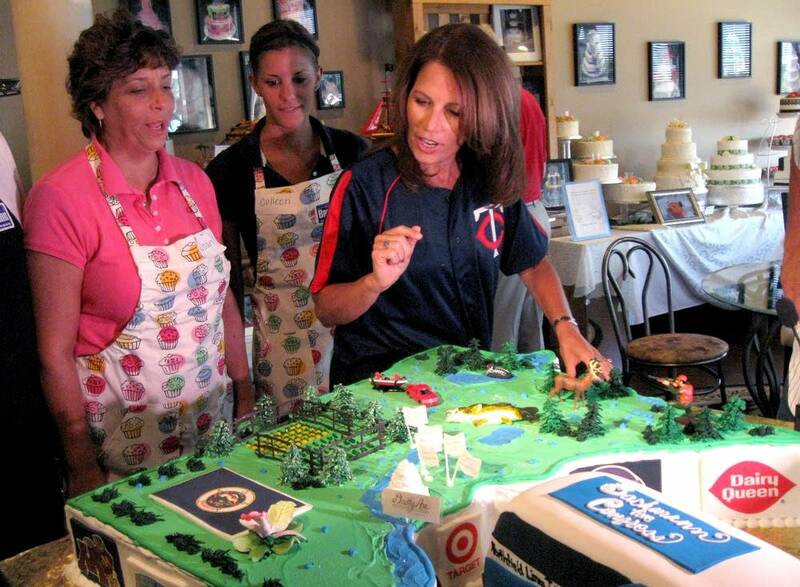 Can Bachmann serve her district while running for president? When U.S. Rep. Michele Bachmann was in the spotlight at the Republican presidential debate in New Hampshire Monday evening, she missed a series of votes in Congress. Bachmann's new role as a declared presidential candidate means she will be spending even more time in states like Iowa and New Hampshire, and less in Minnesota and Washington, DC. But Bachmann insists her constituents in Minnesota's 6th Congressional District won't get shortchanged while she seeks higher office. "I'll be committed to serving the district throughout my time here," she said. "I'll be pursuing the presidency vigorously, and primarily that will be on weekends and on break periods." Scheduling her time will be a challenge, admits Doug Sachtleben, Bachmann's congressional communications director. But he insists that Bachmann will cram both congressional duties and campaigning into the 168 hours that make up each week. "You look at the recesses. We've got one coming up in just a little over a week, and try to plan things accordingly so that she can do a little bit more outside of DC then, and be able to be focused on DC when she's here," he said. Longtime congressional scholar Norm Ornstein doesn't think it's possible to balance running for president with being a member of Congress. "If you're going to run for president as a House member, you pretty much have to give up what you do in the House," he said. Ornstein, who's at the American Enterprise Institute, says past presidential candidates from the House have struggled to attend the hundreds of votes, committee hearings and constituent events that make up a member's life. Previous candidates like Democrat Dennis Kucinich were practically AWOL from the halls of Congress during their runs for the White House. "The amount of time you've got to spend, preparing a campaign, building a staff, getting on the ballot in different states, raising money — it's extremely time consuming," said Ornstein. Bachmann's absences may be welcomed by the Republican leaders in the House, who have often clashed with her fiery rhetoric — although House Speaker John Boehner did tell reporters that he was impressed by her debate performance. Even if the leadership isn't always fond of her, Bachmann has dozens of supporters in the House. Just before she walked onto the House floor on Tuesday afternoon, many of them gave her hugs and congratulations. One of them was Rep. Steve King, R-Iowa, a close friend and political ally. King says it won't matter if Bachmann isn't in Washington often. "Her voice is going to be heard more than it was heard before," said King. "She's clearly on the national stage. So that gives her more leverage and more voice in this Congress and without. I don't see it as a loss, I see it as a gain." Now that she's running for president, Bachmann has suspended her congressional campaign and is no longer actively seeking re-election in the 6th District. But if the presidential campaign doesn't work out, she has until early June 2012 to change her mind and run for her seat. Bachmann is not the only House Republican running for president. U.S. Rep. Ron Paul of Texas is also in the race.